During the holiday’s fondue is a favorite. 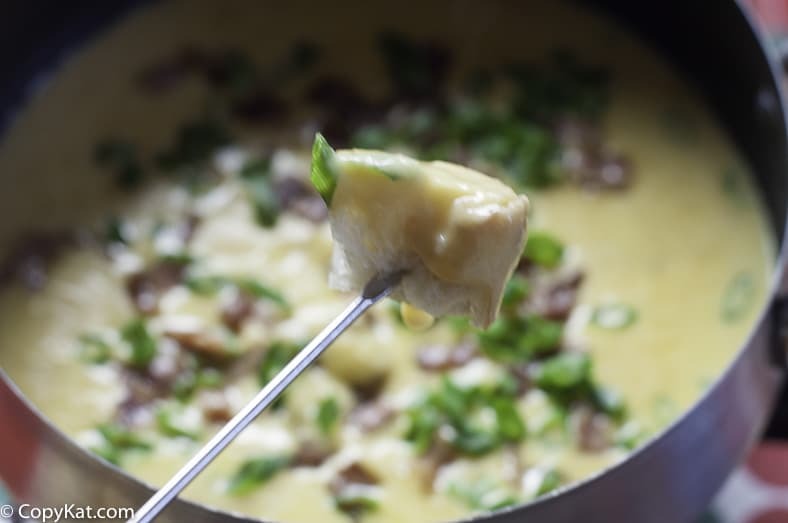 Why not try this fun Cheddar Cheese Bacon Fondue? Fondue is easy to make and can be enjoyed at a party or a special dinner. This post is sponsored by Borden Cheese; all opinions are my own. I love the holiday season, for me, it means spending more time with family and friends and getting to enjoy treats that we don’t get to enjoy all year long. For New Year’s Eve, I love to make a creamy fondue. Everyone likes to dip into the cheesy goodness. Did you know that Borden® Cheese is brought to you by a cooperative of more than 8,000 family-owned dairy farms across the United States? 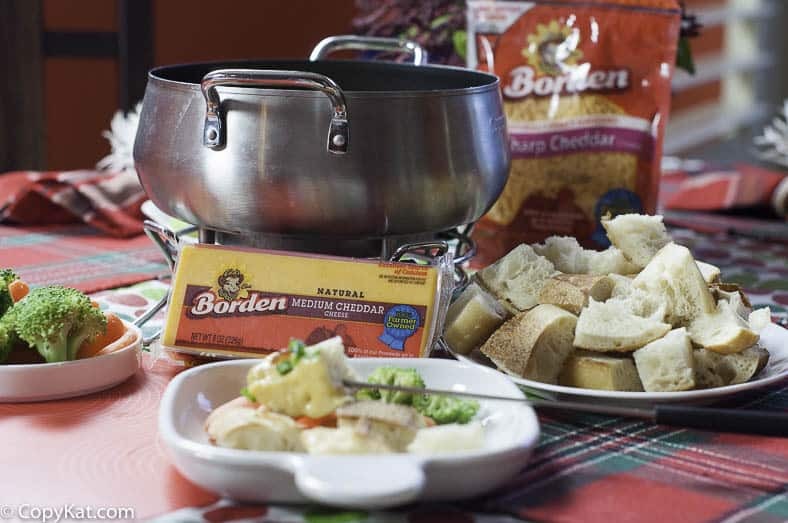 Borden® Cheddar cheese is a great addition to my Bacon Cheddar Cheese Fondue. I know that every chunk, slice, and shred of Borden® Cheese is pure, creamy goodness that transforms my family recipes into something memorable, because with Borden® Cheese, love is always an ingredient. Borden® Cheese has a broad range of offerings to satisfy every taste, including Mild Cheddar, Mozzarella, Mexican, Swiss, Sharp Cheddar, American, Colby Jack and more, which are available as singles, shreds, chunks, slices, string, and snacks. For this recipe, I have used a combination of Sharp Cheddar cheese and mild cheddar cheese. I think the combination of cheeses adds a lovely flavor profile. This fondue is flavored with a light beer, horseradish, dry mustard, and garlic. The fondue also has crispy bacon and freshly chopped scallions. You may want to dip bread into the cheese, baby-cut carrots, fresh broccoli, and fresh cauliflower florets make a delightful addition to the flavor of the fondue. I hope you give this Bacon Cheddar fondue a try. You can find Borden® Cheese at major grocery stores and independent retailers across the country. For more information about our products and where to purchase Borden® Cheese, visit BordenCheese.com, Facebook.com/BordenCheeseUSA or Instagram.com/borden_cheese. Love Fondue? 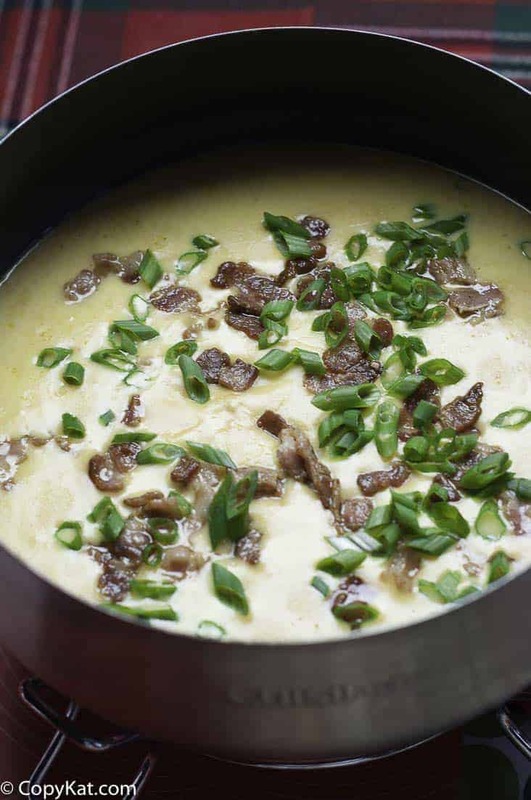 Try this Bacon Cheddar Cheese Fondue. If you do not have a fondue pot to prepare the fondue in, you may prepare a double boiler. To prepare a double boiler place 2 to 3 inches of water in a pot, and then place a heat-proof bowl over the pot. The bowl should make a tight seal. The heat should be turned up high enough to boil, then the temperature should be reduced to medium. Place beer into the bowl with the garlic, dry mustard, horseradish, and Worcestershire sauce. Stir to combine. Combine the cheese and cornstarch together. When the beer warms to almost boiling add half of the cheese. Stirring the cheese constantly, until it has melted. Continue to add cheese by small handfuls until all of the cheese has been melted completely. Add in 3 tablespoons of crispy cooked bacon. If you are using a double boiler remove from heat. Place the cheese in a bowl and garnish with the remaining bacon and sliced scallions. Serve with plenty of bread, baby-cut carrots, green apple, and other items of your choice. Can we substitute beer with non alcohol stuff?If yes what can we use? I would suggest non-alcohol beer.